Lilla Day Monroe authored this pamphlet on behalf of the Topeka Good Government Club's Committee on Legislation. It includes excerpts concerning the property rights of married women and the rights of children to inherit from their mother. 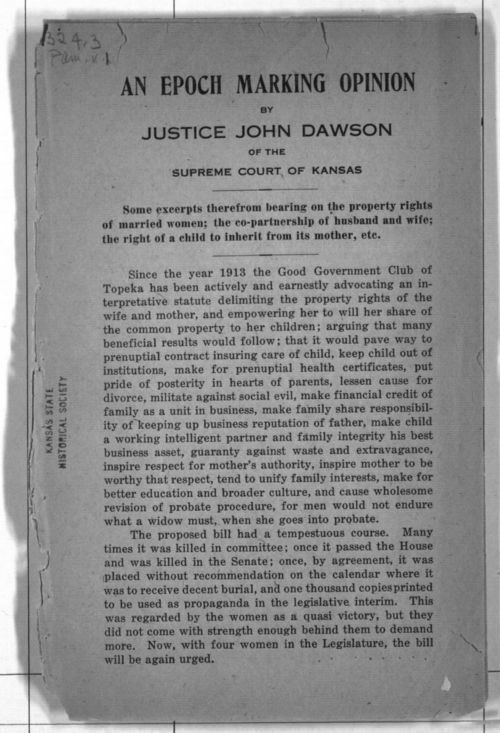 The pamphlet discusses the efforts of the Good Government Club of Topeka to secure passage of a law supporting property rights for women. Monroe was writing about an opinion of Justice John Dawson of the Kansas Supreme Court in case 104 (pp. 47-57), which she felt provided legal interpretation supporting women's property rights. She applauded the support for abused wives but felt the opinion did not adequately discuss the rights of children. Her retelling of the plantiff's case describes in detail the abuses that Ida Doe suffered at the hands of her husband.